5 fast relaxation techniques when you need to calm down now! Whenever you fly on an airplane, you have to go through a safety presentation before take-off. This used to consist of the flight attendants demonstrating the use of seat belts, and reviewing emergency information, but these days, it's often presented as a video on your personal screen. At one point in the presentation, the use of air masks is demonstrated and it always strikes me that it has to be pointed out to mothers to put their own masks on before assisting their children. Why am I mentioning this? Because it's a powerful reminder that we have to take care of ourselves before we can take care of everyone else. Mothers in particular are guilty of not doing this far too often. It's easy to take care of everyone else around you and forget about yourself. We are taught from an early age to put ourselves last when it comes to self-care. This is particularly true for women. Yes, there are times when others have to come first. Your newborn doesn't have a choice and you'll be sacrificing a lot of time, sleep, and energy in those first few weeks and months. But that's temporary and if you ever forget what a toll failing to take care of yourself can take, think back on those crazy first few months after bringing your baby home. The vast majority of our time, taking care of everyone else before ourselves is a choice we make, and one I want you to become more aware of. We don't always intentionally put ourselves last. It's just a habit we've gotten into and it's time to break it. Don't get me wrong. I'm not saying you need to put yourself first all the time. All I'm saying is that when you do, it should be a conscious choice. I'm also here to tell you that it's ok and necessary to take care of yourself first at times. The consequences of always putting yourself last are just too costly. More often than not, when you put yourself last, there's nothing left over. Over time that means you're not the best parent, partner, co-worker, friend, etc. you can be. It feels good to put ourselves last, but when we routinely do it, we're doing more harm than good to those around us. It causes us to be stressed and exhausted. Starting today, make an effort to carve out some "me-time." Do something for yourself, even if it's just enjoying a quiet cup of tea alone, or catching an extra 20 minutes of precious sleep. It's well worth investing time in yourself. Do so more often and see for yourself how powerful the impact can be. 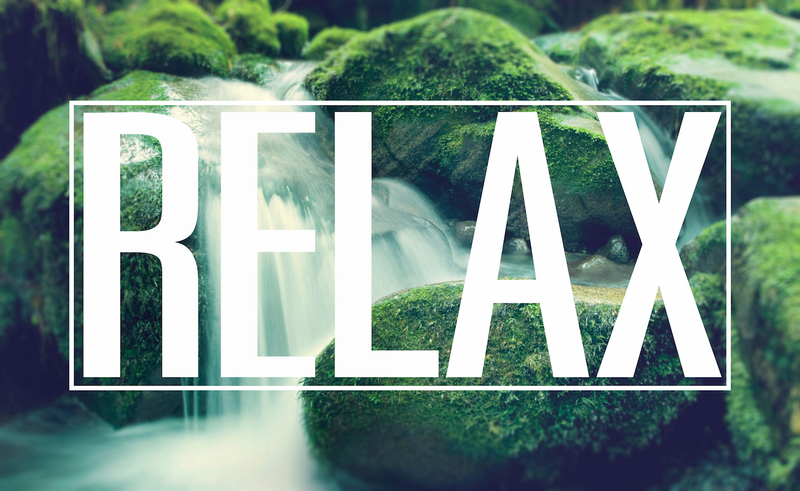 The most direct way to de-stress is to take 2 or 3 slow, deep breaths. When you experience a threat, the center of your breathing moves from your belly to your chest, and your breathing becomes quicker and shallower. Your body then sets in motion the sympathetic branch of your nervous system, which releases stress hormones. The good news is that you can switch off the stressed part of your nervous system through mindful breathing. As you inhale, imagine that your belly is a balloon and you are slowly filling it with air. As you exhale, make sure your belly stays relaxed as it lets the air out. Learn more about breathing techniques. Since stress is the body’s way of dealing with threats, a simple way to de-stress is to use your body’s response to good things to your advantage. A few moments spent thinking how lucky you are to be alive or how grateful you are to be loved or how in awe you are of nature’s beauty all send a chemical message that life is good throughout your body. Though we react to threat in a 10th of a second, it takes longer for the “ all-clear” to sound. We have to spend six to 10 seconds appreciating our good fortune for our body to relax. When you “multi-task”—by talking on the phone while driving, for example—your body and mind require more energy. When you slow down, you relax your body and reduce the demands on your mind. So, when feeling stressed, do a common activity slowly, carefully and with focused attention. Even getting up from your desk slowly gives your nervous system a break. Learn more about meditation techniques.